Broadband for America is a national consortium of over 300 members ranging from independent consumer advocacy groups, to content and application providers, to the companies which build and maintain the Internet. Together, these organizations represent the hundreds of millions of Americans who are literally connected through Broadband. Broadband for America’s mission is to make broadband access to the Internet available to every household in the nation; to provide data transfer speeds to make that broadband experience valuable to users; and to provide the bandwidth necessary for content providers to continue to make the Internet a cultural, societal, and economic engine for growth. 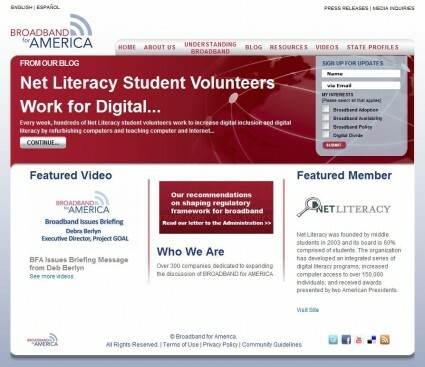 Net Literacy board members serve on Broadband for America’s Digital Inclusion Committee. Click on the image below to read more about how Net Literacy’s state-wide digital inclusion initiative is increasing broadband access to 10,000s of individuals.